In this Prevention article by Caroline Praderio, Hope recommends that you “practice portion control from the point you order, not when it's in front of you.” Hope says to ask your server to bring half the meal already boxed up in a takeout container when you place your order—not at the end of the meal. Have you heard that the Look AHEAD (Action for Health in Diabetes) randomized controlled trial conducted through National Institutes of Health (NIH) was ended two years ahead of schedule? This news crossed my eyes first on 10/20/2012 via twitter. Got to love twitter! The press information from the NIH’s National Institute of Diabetes and Digestive and Kidney Diseases (NIDDK), announced on 10/19/2012 that the trial had been stopped about a month earlier – in September. Why? Because in this long and lengthy trial, in which people had been enrolled for up to 11 years, the people in the intensive lifestyle intervention (ILI) group did not experience a decrease in cardiovascular events (CV) (heart attacks, strokes, etc.) compared with the people in the control group. Can an intensive lifestyle intervention program (ILI) which achieves and maintains weight loss help prevent/delay the heart and circulatory problems which are the most common complications of type 2? USAToday's Nutrition Nation blog Prediabetes: The Silent Menace by award-winning dietitian Elizabeth Ward, RD was posted 1/23/12 in response to the increased interest in prediabetes by Paula Deen's announcement about her type 2 diabetes diagnosis. Want to know the carbohydrate count for vegetarian lasagna, the saturated fat grams for prime rib? Or trying to trim a few pounds and think recording your food intake and getting a daily nudges (reminders) will aid your efforts? Apps with these features and more have multiplied. And they're available for use online and for one and/or as apps for one or more smart phones (eg iPhone, iPad, Android, Blackberry, etc.) Check out my picks from the litter. They’re listed alphabetically within two groups – Apps-For-Free and Apps-For-a-Fee. More free than for a fee! Enjoy viewing my top ten picks for nutrition blogs - all of which are written by registered dietitians. 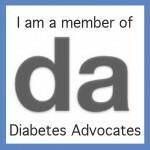 Key learnings from my recent attendance at the American Diabetes Association meeting are sinking in. One clear take away on the nutrition front is the push to eat more fiber for all its health benefits including disease prevention, increased satiety, help with weight control and more.